In Bloomfield, NJ, not far from where I grew up, there is an old-fashioned ice cream parlour called Holsten’s. They have such lovely things on the menu as the “cherry smash”, and grilled cheese with tomato in addition to a wide range of homemade ice creams and candy. I always loved the “Duster Sundae”, which is ice cream, chocolate syrup, malt powder, whipped cream and a cherry. This was probably the first place that I ever tasted malt powder (aside from Malteasers) – and then one day, I discovered that it was possible to purchase malt powder in a regular grocery store. Imagine that! 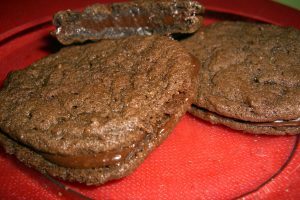 So, now that you know all about my love affair with malt powder…a word on the filling of these cookies. It is amazing. Seriously. It has the consistency of chocolate frosting from a can but it tastes just SO MUCH BETTER. 1. Preheat oven to 350 degrees. Sift together flour, cocoa powder, malted milk powder, baking soda, and salt. Beat butter and sugar on medium-high speed until light and fluffy. Mix in egg, creme fraiche, and hot water. Reduce speed to low and beat in flour mixture. 2. Place tablespoon-size balls of dough 3 1/2 inches apart on parchment paper-lined baking sheets. Bake until flat and just firm, about 12 minutes. Let cool on parchment on wire racks. 3. Meanwhile melt chocolate and butter in a heatproof bowl set over a pan of simming water, stirring. Remove and let cool slightly. Beat malted milk powder and cream cheese on medium speed until smooth. Gradually beat in heavy cream, chocolate mixture, and vanilla until well mixed. 4. To assemble the cookies, spread a heaping tablespoon filling on the bottom of one cookie. Sandwich with another cookie. Repeat. Cookies are best stored in a refrigerator.